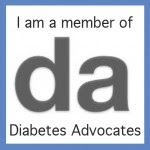 "What is one thing you would tell someone that doesn't have diabetes about living with diabetes?" I don't even know how to pick just one thing. There are so many, many things I wish other people could understand. I love Jacquie's post from yesterday. Sometimes it would be nice to be able to "give" someone else diabetes for a couple days, just so they could better understand what it's like. Only temporarily, I promise. I wouldn't wish this on anyone. If I have to narrow it down to one thing, it would be this: even when you don't think I'm thinking about diabetes, I am. If you have diabetes, then you know how waking up with a blood sugar of 314 feels. You know the tooth sweaters, the parched feeling in the back of your throat, and how gross it feels getting up all sweaty. You also know the frustration I feel. About how waking up with a high can completely throw off your whole day. That I won't be eating breakfast for a while. I'm headed to work shortly. Will I tell my coworkers about my morning? No. Maybe they'll catch me checking my CGM a lot (because I will be) and ask if everything's ok. If they do, my answer will likely be, "Yep, I'm fine, thanks." I will be thinking about diabetes off and on all day. Every day. 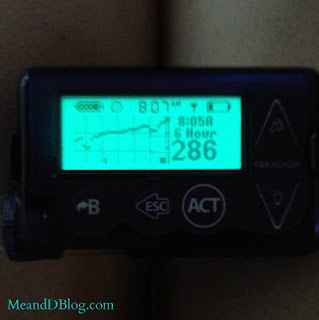 Every time I check my CGM, I'm clearly thinking about diabetes. But just because my pump is hidden away in my pocket, that doesn't mean I'm not thinking about it. Whether at work, out to dinner with friends, driving in the car, or watching TV at home, diabetes is always there. I do think about other things, of course. Every moment of every day is not consumed by diabetes. But more moments than I would like are consumed by it. I try very hard to make diabetes look like it's no big deal. But it is a big deal. And sometimes I wish other people could understand how exhausting it is. Because even when it doesn't look like I'm thinking about diabetes, I am. For more What They Should Know posts, click here! You know how much I hear you on this topic. It takes so much work to make it seem like this whole thing is no big deal. yep yep yep, all i can say is yep.